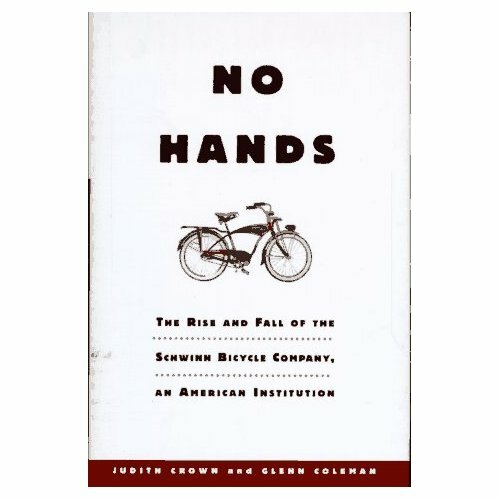 No hands: The rise and fall of the Schwinn Bicycles Company: an American institution, Judith Crown & Glenn Coleman, Henry Holt&Co. When I arrived in Florida in early January I noticed all these Schwinn-bikes on campus, in the gym and in the supermarkets. This aroused my curiosity about this brand I already heard of, but who still was misterious to me ; that’s why I lended No Hands: The rise and fall of the Schwinn Bicycle Company: an American institution in the UWF Library. And here’s what I learned in the book, that was published in 1996 (and therefore does not cover Schwinn’s most recent history). Judith Crown, who is a senior correspondent for BusinessWeek in Chicago and worked for Crain’s Chicago Business, started the book in 1992 after she heard that Schwinn was in serious financial trouble. With Glenn Coleman from Crain’s New York Business, they started investigating the reasons for the turmoil of America’s most notorious cycling brand. 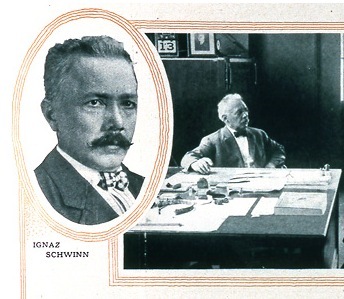 Ignaz Schwinn emigrated to the United States in 1891 and make profit from the late XIXth century’s bicycle boom to create a successful bicycle manufacturing company with an American partner, the Arnold, Schwinn & Co. The turn of the century and the start of the automotive era (Ernest Pfennig bought the first Ford T in 1903) saw a wave of consolidations in the bicycle business, out of which Schwinn emerged weakened – but even more ambitious. Various takeover made Schwinn one on the big players, and retailing through mass merchants allowed the Chicago-based company to achieve big sales. In 1928, the in-house brand for motorcycles that had been acquired in 1912 and 1917, Excelsior-Henderson, even ranked 3rd in the national motorcycle industry. During the following decades, Schwinn built up a (very) strong brand. 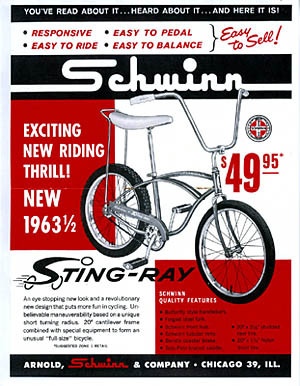 The best example certainly is the success of the Sting-Ray that originated from the Californian kids’ street culture (at that time, Schwinn listened to its customers…). Sociologist Arthur Asa Berger saw it in a bit more, let’s say, austere way : “[the Sting-Ray] symbolizes a perversion of values, a somewhat monstruous application of merchandising and salesmanship that… has led to grave distortions in American society“. His vision may be exagerated, but what he said about Schwinn’s marketing efforts gets to the heart of the company’s success : they mastered selective distribution and franchising better than any other consumer product company at the time. Furthermore, Schwinn’s “customers around the country were true believers“, as the book states on page 75, and owning a Schwinn was considered a status symbol in the 60’s. In the 70’s, Soutern California kids started following new trends (the BMX), just like the kids created the Sting-Ray culture during the sixties. This time, however, Schwinn decided not to engage into the movement, maily because the company saw the sport as too dangerous and unsuitable with Schwinn’s quality image. 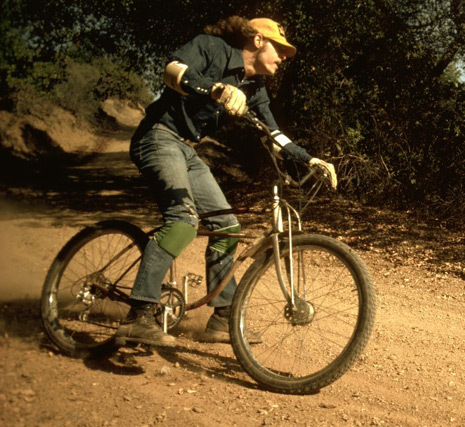 The same happened with the mountain-bike culture of the 80’s pioneered by Northern California riders like Michael Sinyard (founder of Specialized), Tom Ritchey and Gary Fisher. What Schwinn didn’t recognize is that trends are often set by minority thinkers, and not by the Number One. 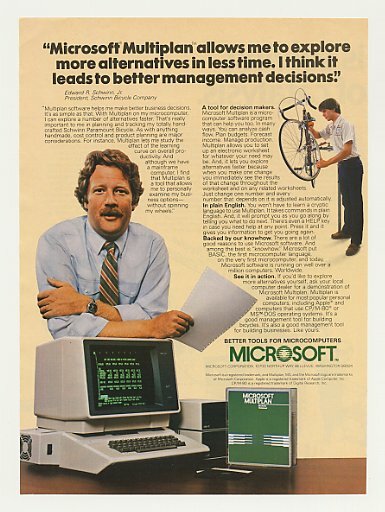 But what eventually drove Schwinn into the turmoil that led the company to file for Chapter 11 in 1992 was it’s inability to cope with management and quality problems, as well as some unsuccessful investments. Basically, the company had to choose in where to produce bicycles at a more competitive prices. 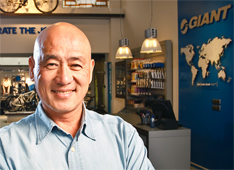 The Schwinns decided to turn to Taiwan and China, but even though suppliers like Tony Lo’s Giant Manufacturing (photo) made high quality products, unlucky sourcing desisions led to supply shortage, angry retailers and receding customers. Edward Schwinn, CEO, just wasn’t as passionate about bicycles as his ancestors were. Yoshi Shimano, who was Edward Schwinn’s personal translator during his business trips to Asia, described him as “a nice fellow“, who “had a lower degree of interest for the business“. In 1992, Schwinn filed for bankruptcy. Ed Schwinn looked for an investor during the difficult years that preceded this sad ending, but this reveals a part of the problem : instead of an investor that would provide funds to keep the business running, Ed Schwinn should have found a buyer, which implies that this buyer would have taken control of the company – what the Schwinns wouldn’t accept. When the company was too damaged to be saved, the company and name were sold to the Zell/Chilmark Fund, an investment group, in 1993. He now runs a cheese shop in Wisconsin, so he certainly won’t destroy another American institution ! ← Previous Post After postmodern marketing, what would Altermodern marketing look like ? Very interesting story,thank you .